Education: Dresden Art Academy, Dresden Kunstakademie Düsseldorf, Düsseldorf. Awards: Praemium Imperiale, Tokyo, (1997); Wolf Prize, Jerusalem (1994–1995); the Oskar Kokoschka Prize, Vienna (1985); and Arnold Bode Prize, Kassel, Germany (1981). Made an honorary citizen of Cologne in April 2007. Gerhard Richter was born in Dresden in 1932 to a middle class family. Like many Germans of his generation, his relatives were involved in the Nazi movement; his mother's brother, Uncle Rudi died a young Nazi officer, while Richter's mentally disabled aunt was imprisoned in a Hitler euthanasia camp. Rigorous ideology and death have haunted Richter since he was just a child, perhaps causing his strong dislike for ideology of any kind and underpinning the attraction that nature, as an indiscriminate force, holds for him. Support from his mother encouraged him to become an artist during his mid-teens and he embarked on a classical education at the Dresden Art Academy in Communist East Germany. Years later and a few months prior to the erection of the Berlin Wall, he and his wife fled with only a suitcase to Düsseldorf in West Germany. From 1961 to 1964, Richter studied at the Staatliche Kunstakademie Düsseldorf under Karl Otto Gotz. During the early sixties Richter met and began to work with artists such as Sigmar Polke, Konrad Fischer-Lueg and Georg Baselitz. Their work, and Richter's in particular, began to have an impact in Germany, and eventually international art circles. Richter's beliefs are credited with refreshing art and rejuvenating painting as a medium during a period when many artists chose performance and ready-made media. Together with Polke and Fischer-Lueg, Richter formed a group called the Capitalist Realists. The Capitalist Realists were satirical, often deriving subject matter from print media. Richter began to see art as something that had to be separated from art history; he believed that paintings should focus on the image rather than the reference, the visual rather than the statement. He wanted to find a new way of painting that would not be constricting. Richter emerged from the group to become one of the most sought after contemporary artists in the world. Richter's first solo exhibition was held at Mobelhaus Berges, Düsseldorf in 1963. It was the first presentation of his photo-based painting style. Richter blurred the paintings, modernising traditional art through technique, and using photography as his source of material. These blurred paintings of photographs are close to reality but also contain a nostalgic distance, because the eye can never precisely capture the image being viewed, rather like trying to remember the features of a person whom one hasn't seen for a while. Only the outline is remembered, and the rest blurred. With his photo-based paintings of regular images, Richter has tried to subvert the hierarchy of art and the everyday. "I believe in nothing", he has said. In 1967 Richter won the Junger Westen Prize and began to paint the Colour Charts, Grey Paintings and Forty-Eight Portraits; the Colour Charts are structured on a pre-established system of colour determination, removing artistic whim; the grey paintings contain no interpretable images but are experiments in brushstroke and the application of paint; the portraits are images of intellectuals Richter selected from an encyclopedia. In 1972 Richter was chosen to represent Germany at the Venice Biennale. That same year, he exhibited at Documenta in Kassel, where he showed again in 1977, 1982 and 1987. At Documenta in 1982 Richter was awarded the Arnold Bode Prize and in 1985 in Vienna the Oskar Kokoschka Prize. Richter's first exhibition in the U.S. took place at the Reinhard Onnasch Gallery in 1973. Fifteen years later in 1988 he was given his first North American retrospective organized by the Art Gallery of Ontario, Toronto and The Museum of Contemporary Art, Chicago. In 2001 the Museum of Modern Art in New York exhibited a retrospective of Richter's paintings called "Forty Years of Painting". Curated by Robert Storr, the exhibition was critically acclaimed. The 2001 Retrospective at MOMA displayed how diverse Richter's paintings are. His early work is of blurred figurative paintings, both with and without colour followed by seductive abstract paintings, with a colour palette that is either brilliant or subdued. 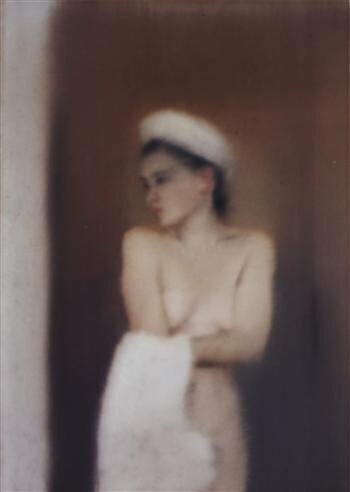 His surprisingly diverse range of work has received prolonged discussion from critics, especially due to Richter's disregard for "traditional" stylistic progression and his use of photographs. Unlike American artists Richter wasn't interested in the purity of art. Idealism had disillusioned him from an early age. Instead he painted images without glory; images that rendered the ridiculous, ordinary; the tragic, ordinary; the beautiful, ordinary. Throughout his career Richter has shrunk from giving a psychological insight into his art, leaving his admirers and critics guessing and at times confused. According to him, his work forms from structures and ideas that surround him, nothing more profound than that. In August 2007 Gerhard Richter's new stained glass window for the south transept of Cologne Cathedral was unveiled. The original window was destroyed in World War II and had been replaced with plain glass. Inspired by Richter's 1974 painting "4096 Farben", the window consists of around 11,500 hand-blown glass squares in 72 different colours. Echoing the colours of the surrounding windows, Richter's illuminated abstraction blends a modernist aesthetic with the Gothic ecclesiastical architecture of the cathedral. Richter, a resident of the cathedral city since the early 1980s, was made an honorary citizen of Cologne in April 2007.